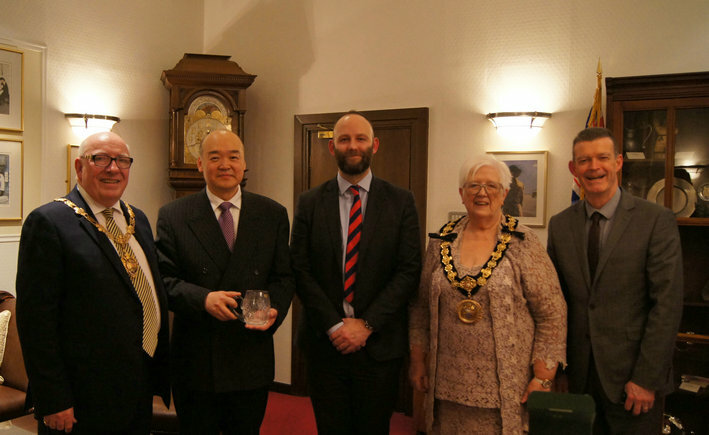 Consul General Dr. Sun Dali was invited to visit Salford and meet with the Ceremonial Mayor and Consort Councillor Karen and Robin Garrido, City Mayor Paul Dennet and City Director Jim Taylor in the company of Consul Lyu Xiaomei on Dec. 20, 2016. Consul General Dr. Sun expressed appreciation of Salford taking an active role in cooperating with Chinese partners. He stated that Chinese President Xi Jinping's visit to the UK last year launched the golden era for China-UK relations and released immense opportunities for the north of England to work closely with China. With Chinese economy growing stably and rapidly, more and more Chinese visiting abroad, there is great potential for mutual cooperation between Chinese cities and the north of England.The success of Chinese companies in Salford would pave the way for future expansion of Chinese investment in the city. Chinese Consulate General will continue to bring close our Consular area with Chinese provinces and cities to substantiate China-UK relations with more concrete cooperation.